Very nice write up on the difference between the catalin and wooden cabinets. 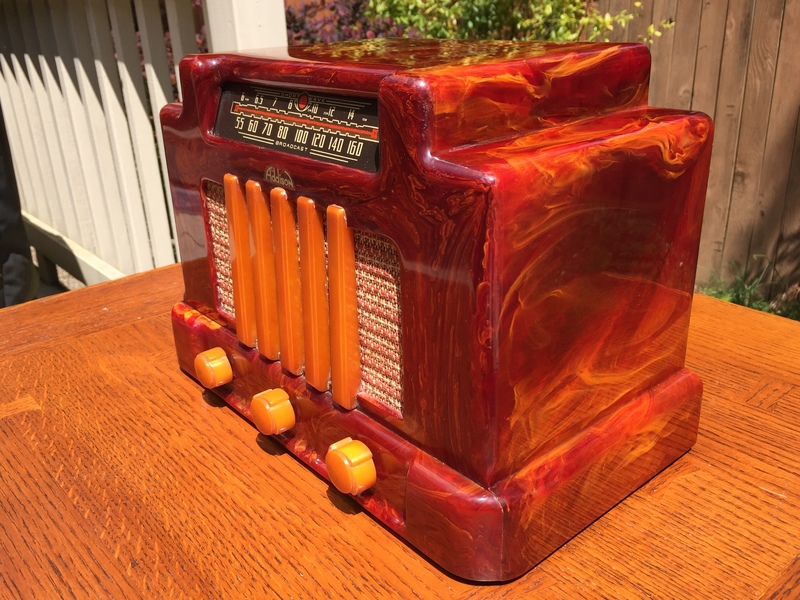 I have noticed that on sites selling radios, Canadian radios always rank high in their electronic quality. 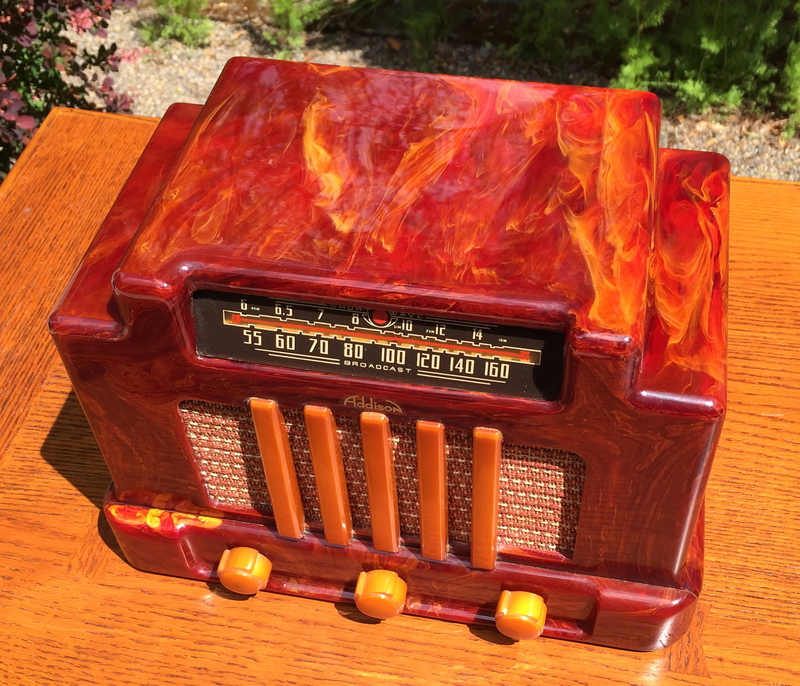 Some seller’s actually esteem the quality in Canadian made radios. 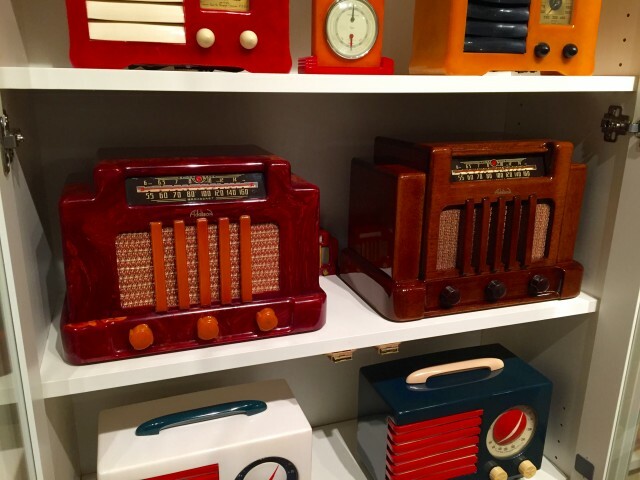 The main reason seeming to be simply that the demand for radios in Canada at the time was less and more time was spent by the employees in putting out a quality product as opposed to the more mass produced radios made in the States. Not that the American counterparts were bad or in many cases just as good, but simply that the chances of a better constructed radio might be the case if it was made in Canada. 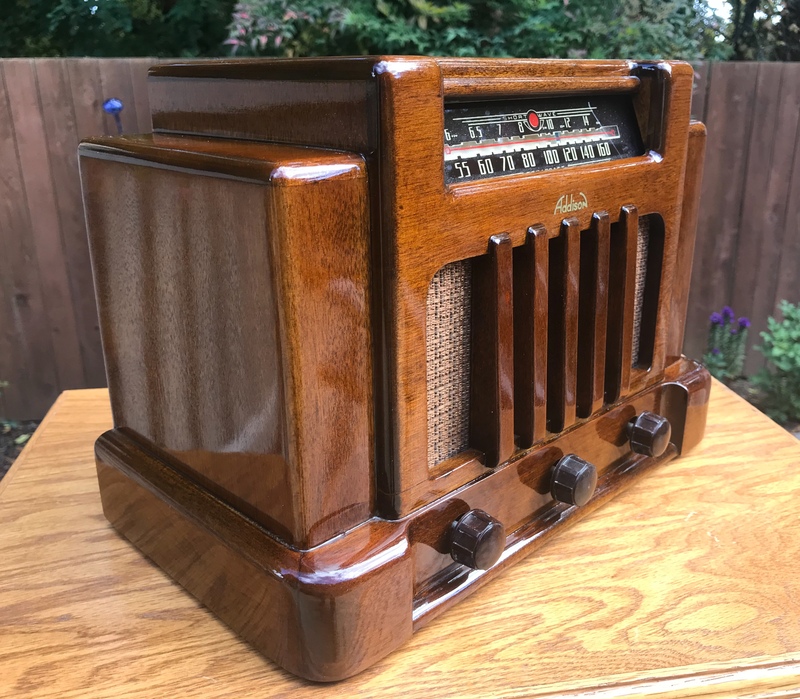 Where does the wooden counterpart sister radio of the Addison Model 5RA3 “The Courthouse” Radios rank in comparison to their more famous Catalin sister radios. I assume the electronics are the same? Editor: You are correct. The chassis is the same for both radios. They really are cool! Of course the Catalin version is many times more valuable. Editor: The information I have shows both the wooden and Catalin Addison 5’s came out in 1940 and halted production in 1947. Good luck with your restoration! Thanks, The radio is in tact and appears to have been sitting in a dry area for many years with spider webs to prove it. Perhaps a dry garage as there are no signs of rust. But the shipping could have been better as the wooden cabinet is becoming unglued, not damaged but obviously took some rough knocks during the shipment. All the parts are there and the original knobs, even the original Addison marked tubes not broken! So those are good signs and bad signs, and the glass Dial Face made it through fine. The gluing and refinishing of the wood would have been needed anyway. 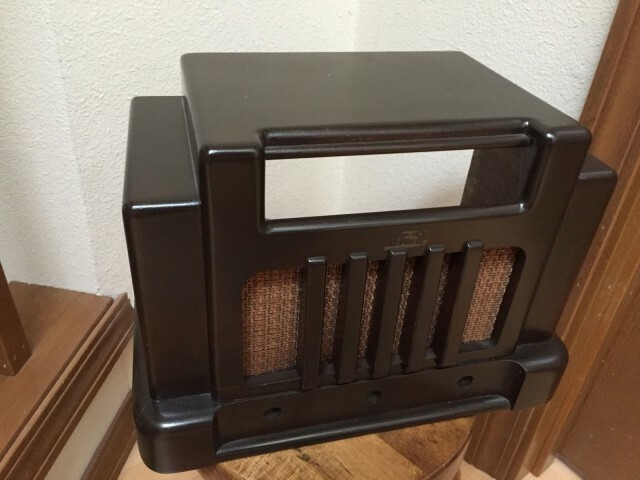 Just hope the finish comes out as nicely as your wooden cabinet! 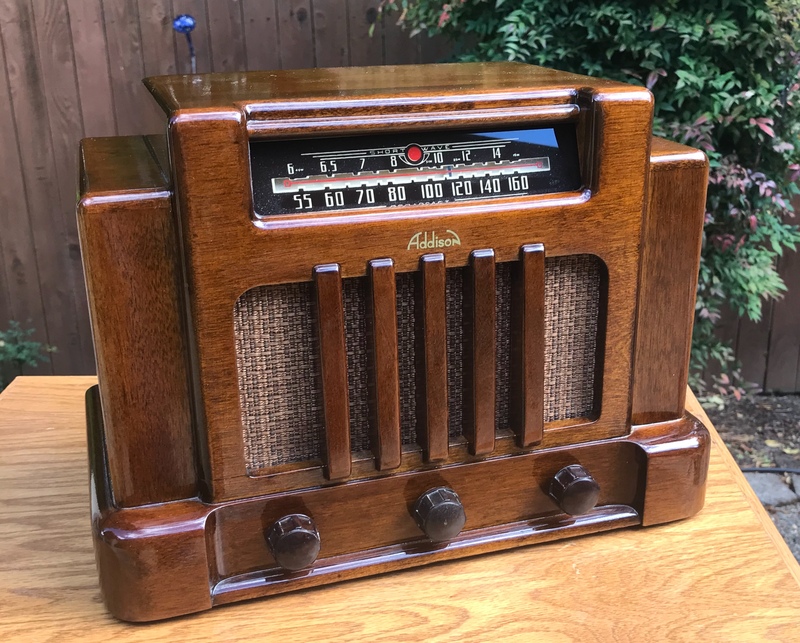 As my Addison radio is in an unrestored condition needing a lot or re-glueing and sanding to get back to the original finish, as you have done this work on your darker cabinet, are there any recommendations you may have for me in the finishing toners to be used for my radio as the work has not started as of yet. Luckily the seams that have parted are due to the glue having dried out and can be repaired with hopefully no prior damage noticed. Previous Previous post: Great Consoles & More!